Royal Dublin rookie Niall Kearney reckons he'll make his European Tour debut in Africa in January. But the former Walker Cup ace, 21, has his fingers crossed for an invitation for next week's South African Open. He said: "I've written to the promoters but with my category of membership, I'd say I'll definitely be playing in the Joburg Open after Christmas." Kearney finished up as first reserve for this week's Alfred Dunhill Championship at Leopard Creek but did not travel after narrowly failing to earn his card at last week's six-round Q-School. At least three management companies have shown an interest in signing Ireland's latest golfing starlet - giants IMG, British based GMI and Dublin agency Horizon. Assured of Challenge Tour status next season as well as invitations to European Tour events, Kearney said: "Nothing has been finalised yet but hope to have signed with a manager over the next couple of weeks." Royal Dublin’s Niall Kearney has jumped in at the deep end by turning professional for the start of the gruelling European Tour Qualifying School Finals in Spain on Saturday. The 21-year old Walker Cup player moved seamlessly into the pay-for-play ranks when he decided not to sign the form waiving his right to the modest prize money on offer at PGA Golf de Catalunya near Girona. Niall Kearney is a towering six feet four inches but he looked 10 feet tall as he fired a brilliant, three under par 69 on the stunning Stadium Course to stride like a colossus in the last two rounds of the 108-hole European Tour Qualifying School finals at PGA Golf de Catalunya. Just 10 weeks after he impressed in the Walker Cup on US soil, the 21-year old from Royal Dublin continued his remarkably poised professional debut to share 24th place on seven under par with the top 30 and ties earning tour cards tomorrow evening. 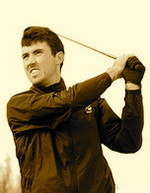 Rookie Niall Kearney has joined former Ireland team mate Shane Lowry in the Horizon Sports Management stable. The Dubliner, 21, signed with the Dublin-based management group this week and hopes to make his tour debut in Africa in January. Niall Kearney plans to keep his cool when he makes his European Tour debut in this week’s Africa Open. The Royal Dubliner rookie, 21, knows that getting hot under the collar is not a recipe for success as he swaps ice-bound Ireland for sweltering South Africa. Determined to enjoy his first taste of the big time Kearney said: “Everyone says it’s really tough to make it on tour but I’m going out with the attitude that this is a year to learn and get experience. Niall Kearney plays his second shot from under the trees on the par-five third at the Stadium Course in the fifth round of the European Tour Qualifying School Finals at PGA Golf de Catalunya. Niall Kearney’s hopes of grabbing his European Tour card suffered a massive blow when crashed to joint last place following a fifth round 76 at the European Tour Qualifying School Finals in Spain.